The Pope has ordered cards be printed and distributed depicting victims of the nuclear bombing of Nagasaki — captioned 'the fruit of war'. 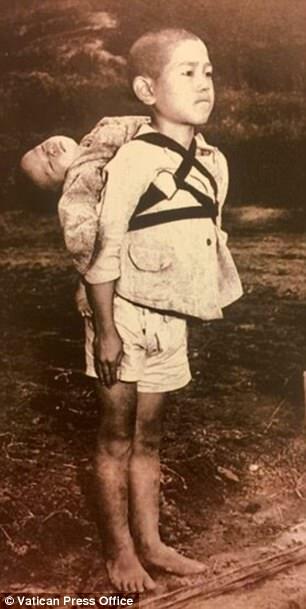 The harrowing image shows a boy carrying his dead brother on his shoulders while waiting in line at a crematorium. It was captured by US Marine photographer Joe O'Donnell after the nuclear bombs were dropped at the end of World War II. 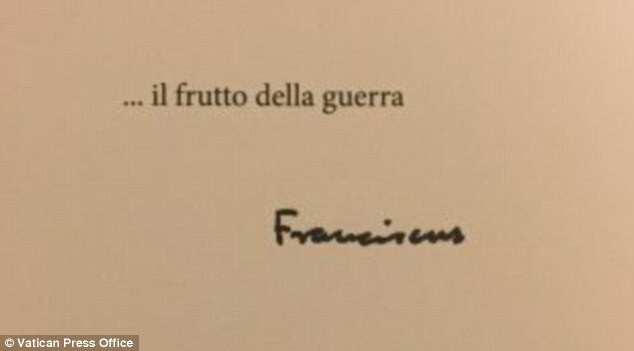 Pope Francis requested that 'the fruit of war' be written on the back of the card, accompanied by his signature. 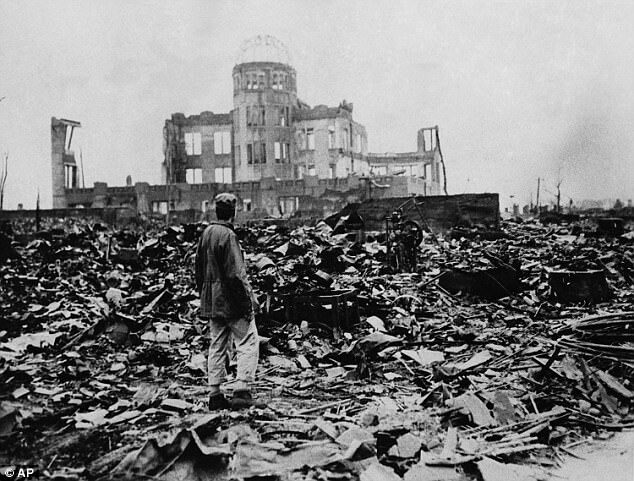 After the bombing of Hiroshima and Nagasaki in 1945, Japan's subsequent surrender ended World War II. Photographer O'Donnell then spent a further four years recording the aftermath of the bombings in the two cities, according to Library of Congress records. 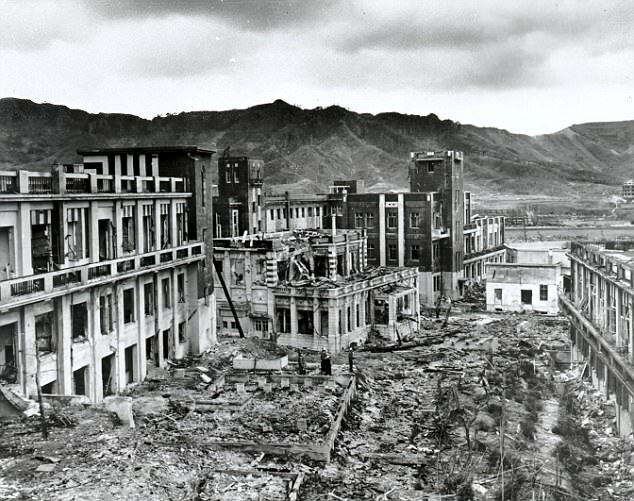 The US's nuclear strike against Nagasaki on August 9, 1945, came three days after a similar bomb was dropped on HiroshimaThe striking images were published in Japan 1945: A US Marine's Photographs from Ground Zero. Pope Francis has previously condemned the nuclear weapons and highlighted the plight of children in war zones. 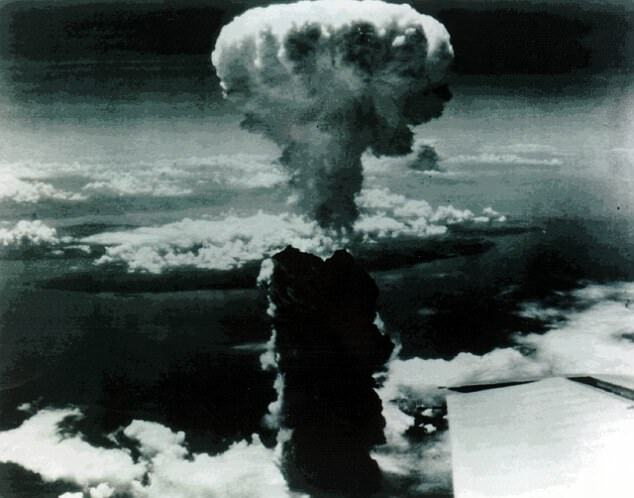 The US's nuclear strike against Nagasaki on August 9, 1945, came three days after a similar bomb was dropped on Hiroshima. These attacks resulted in the deaths of around 120,000 people. Japan surrendered six days later. The distribution of the cars suggests the Pope believes the message is especially important at this time of year and comes amid heightened tensions between the U.S. and North Korea. Left: U.S. President Donald Trump and right: North Korea's leader Kim Jong UnThe harrowing cards comes after the Pope told an anti-nuclear weapon conference that the possession of nuclear weapons was now 'irrational'. 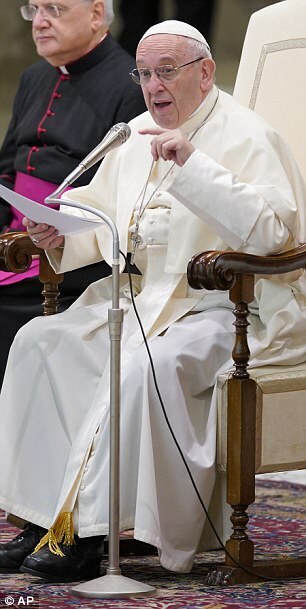 In November, the Pontiff said: 'We're at the limit of licitly having and using nuclear arms. 'Why? Because today, such sophisticated nuclear arsenals risk destroying humanity or at least a great part of it. It comes amid continuing heated rhetoric between the U.S. and North Korea. 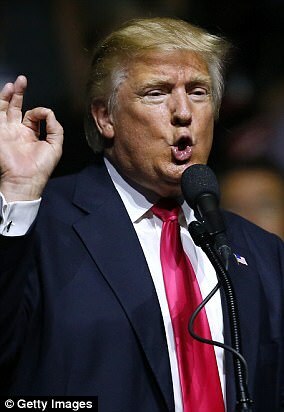 'Today, is it legitimate to keep nuclear arsenals as they are? Or to save creation, to save humanity today, isn't it necessary to go back?' Pope Francis added. 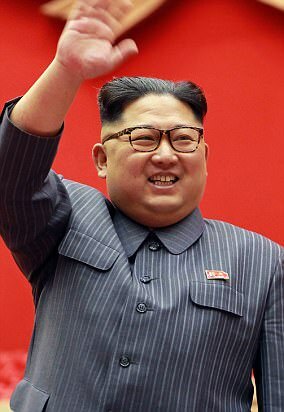 The Vatican City was also said to be desperately attempting to open a dialogue between Pyongyang and the Holy See, the Express reported last month. Cardinal Peter Turkson of Ghana, head of the Dicastery for Promoting Integral Human Development, said: 'The dicastery is already in communication with the Korean episcopal conference to see how we may have contact also with the regime on the other side. The paintings in this link (www.gazernica.com) reflect the devastatingly political impact of the world's calibrated indifference not only to the plight and suffering of the Palestinian people, but of all people displaced through the sanctification of corporately-funded-warfares.